There's nothing better than spending your time on a houseboat, and I simply want to share all my houseboat knowledge and boating experience with you. With 40 years of boating experience and as a houseboat live aboard, it was decided to create a visitor friendly website filled with valuable information for the new, curious, beginner, or experienced boaters. I hope you enjoy the site and do hope you join our free online Houseboat INSIDER newsletter to get all the latest updates. What's great about Houseboat Living? The Reason Why I Created this Website. See How I Got Started with Houseboats? 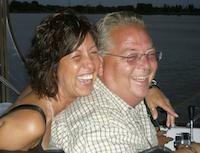 Linda and I are very lucky as we both enjoy the water and the boating environment. I am also fortunate since Linda has great "female input" on the site, and the best part is that she can manage the website tasks. When I decided to build a website I never imagined that the website would grow so large and would attract thousands of daily visitors, and little that I know that it would directly help so many people around the world. With all of the websites free features, has the site helped you? With the explosive growth of smartphones today, internet use has gone from browsing at home (or at work) on a desktop/laptop computer, to now spontaneously searching the internet anytime, and from anywhere. 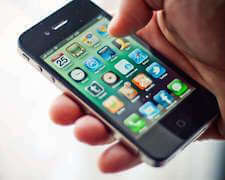 Of the 2,000 daily visitors, we can see that mobile traffic has grown exponentially in the last 5 years. Want to setup your phone with a AAHB icon? * member and volunteer Instructor for the Canadian Power Squadron. * volunteer for Search & Rescue with the Canadian Coast Guard Auxiliary. * an electrical, mechanical, and computer science background. After a lifetime of boating I have gained some valuable knowledge and experience along the way, and managed to thoroughly "learn the ropes". Reason why a website was created. If you spend any time on the internet today, you will quickly find out that there's plenty of sites that are "commercial" in nature. Everybody is trying to sell you something, and often it is full of "one-sided" sales oriented, marketing hype. Don't get me wrong, we need companies and corporate sites to buy products, goods, and services from, however we often just need some basic unbiased information first, in order to be able to make educated buying decisions. This is where the site blueprint got started, and how I decided that there's boaters everywhere who just want some simple down to earth, honest, real hard facts and tips. I created this website with SBI's help (and highly recommend them). I had a really simple goal in mind, to share our knowledge and experiences, and to help and educate boater's with some of their important decisions along the way. Over the years, it's been overwhelming all the questions that we receive from prospective houseboat buyers, all asking "How & What" they should buy in a boat. 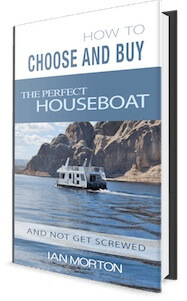 That's why I invested over a year to write an ebook, and the best thing so far has been the response we've received to our invaluable How to Buy a Houseboat ebook. I can see that the 135 pages has solved all the questions that people were asking about when it came to "choosing & buying" that dream boat. I do sincerely hope that you enjoy, and take advantage of the website and all 1,300+ pages as it was created for you. Now if you're a marine/boating related business, you might be interested in advertising on our website? You can take advantage of our special rates, and increase your sales/exposure with our Houseboat Business Advertising. Support the Site - get a free ebook with your donation. Because of the site and the hundreds of emails that we receive, many of you have taken advantage of the free classified ads, and many can now make more knowledgeable informative decisions about buying, selling, building, repairing, insuring, transporting, and even living on houseboats. The site is free for all our readers and visitors, yet the time, work, and expenses involved have grown exponentially. 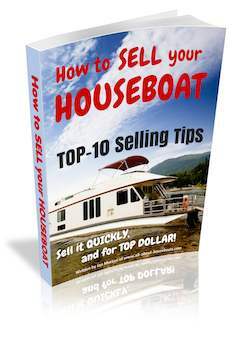 If you appreciate and enjoy all the free helpful information and classifieds, take a moment right now, support your site and get a free "How to Sell your Houseboat" ebook. The "How to Sell your Houseboat" ebook has the TOP-10 Selling Tips that provides you with information and techniques used by many professionals around the world. You'll learn secrets on how to prepare, market, and how to successfully finalize the sale of your boat. You should definitely use these strategies and get this eBook before listing your houseboat for sale. This ebook is a $9.95 value, and the donations are securely handled through PayPal, or your credit card. We're glad that the website has helped you and we really want to thank you for all your support. Just click the "Add to Cart" button, and enter your donation amount. You'll receive a free ebook. Curious how I got started with boats? 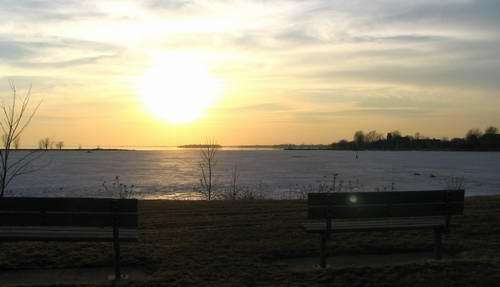 The sunset view from the marina. A special thanks goes to my dad as he was the one that started my passion for boats as a child, since I'll never forget my first trip to a marina. There was all kinds of boats, people, and activities. I knew at that moment, that this was a special place for me. The people were kind, friendly, and helpful, and I couldn't help noticing that the birds, fish, and wildlife all seemed to be alive, and the aroma of a nearby BBQ was inviting. Needless to say, I would always find myself going down to the docks, to go fishing, boating , or just to hang out and throw french fries to the seagulls (hmmm, poor seagulls, now I find out "trans-fat" is bad...) So, after years of boating, fishing, and hanging around marinas, I came to the realization that I hated packing the car on Sunday's, only to re-pack the car again on Friday, to come back for the next weekend. 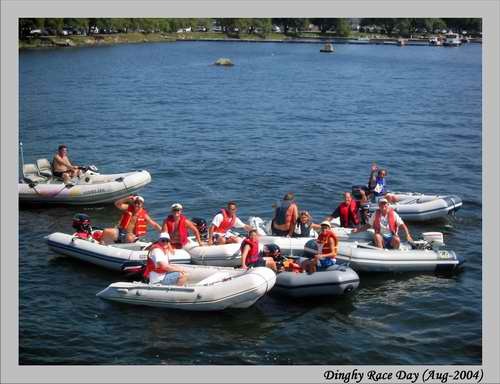 One of the Dinghy Race Days that we organize for our fellow boaters. Well, that's enough About Us, and do join our free online Houseboat Insider newsletter to get all the latest updates.